A game changer at the recent Australian and New Zealand Society of Palliative medicine 2016 Conference (#ANZSPM16) was Dr Merryn Gott’s plenary presentation on the hidden costs of caring. Little is known about the financial impact of caring for people at the end of life. I had wanted to learn to paint for many years, and finally found the time to take some classes during my research fellowship year. It was really good fun and I loved it. Unfortunately, my fellowship year soon finished and clinical commitments meant I could no longer attend the classes. Nevertheless, I decided that I would keep painting, once a week (usually on a Wednesday), just for me. At the end of a busy day, it’s often easier to just slump on the couch and watch some TV. I’ll be honest, sometimes the couch wins. However, I do manage to drag myself out of the house again most Wednesdays, get myself down to the studio for a couple of ours of what I fancifully call my ‘art therapy’ before bed. And when I do, I never regret it. As you can see, I’m just a beginner and still have a lot to learn about painting. But I love losing myself in the work, just thinking about form and colour – anything other than patients and families and suffering and medicine, or audits or guidelines or research or presentations. I also love heading out and painting outdoors when I can get away. If you also like painting, or any other form of art – please join us for #PallANZ tweet chat on the 29th, which will be on the topic of “palliative care and the arts”! You can find the details here. This month, we are excited to explore how palliative care can help to support young people in our community living with serious illness! 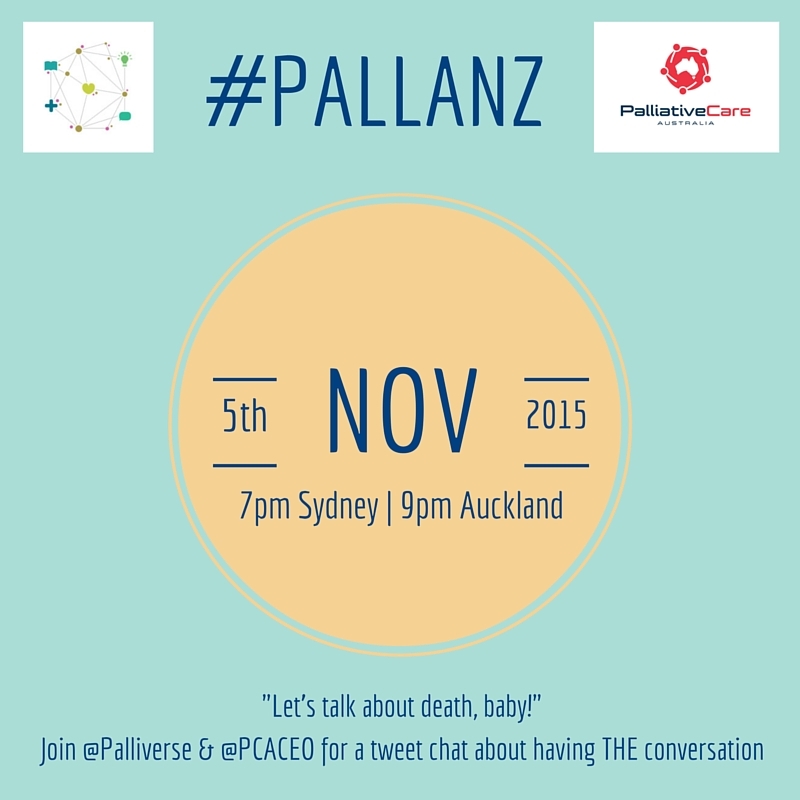 Our upcoming #PALLANZ tweetchat to be held at 7pm (AEST) on Thursday 30th June will discuss topics related to the palliative care needs of children and adolescents and their families. We will also be featuring some guest blogs from new Palliverse Contributors working with young people in Paediatric Palliative Care (#pedpc). During our #PALLANZ tweetchat, we hope to bring together those interested to talk about how a kid’s #pedpc service can help young people with serious illness to live well; when a young person might meet the #pedpc team; and where they might like to receive care. We’ll also imagine we have a magic wand able to do anything we want to improve the available supports and share these ideas and other helpful resources! Join next week’s #PallANZ tweetchat on the topic of “Living Well with Chronic Illness”, the theme of Australia’s National Palliative Care Week (#NPCW16). Anyone with experience of living with life-limiting chronic illness, having a loved one with chronic illness, or working with people with chronic illness, is encouraged to participate. You don’t have to be Australian, and Twitter newbies are welcome! Australian Institute of Health and Welfare statistics show that most people who who access palliative care have cancer. However, palliative care can be of benefit to many people living with non-malignant diseases and chronic illness as well. These include dementia, heart disease, lung disease or kidney disease, to name a few. Many people could benefit from what palliative care can offer, such as management of pain and other symptoms, advance care planning for the end of life, and support for carers. Advance care planning is an important process that is increasingly being taken up by our community. When done well, it can help those with serious illnesses take control of their future health care. However, many people in our community still do not know about advance care planning, which means those who are likely to benefit from the process are missing out. And we’re back for another round!